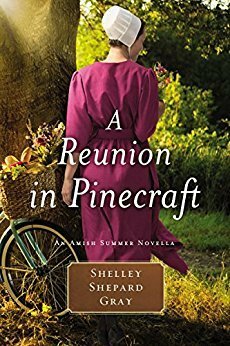 Today I am reviewing A Reunion in Pinecraft, the fourth book of the Amish Brides of Pinecraft series by Shelley Shepard Gray. When sisters Sharon and Sherilyn Kramer attend a wedding in Shipshewana, one of them returns with a new penpal while the other returns to her job at the bakery. After sending weekly letters back and forth, Sherry and Graham Holland arrange a reunion in Pinecraft. Upon Graham’s arrival, however, he realizes he’s been writing to the wrong sister. He decides to use the reunion as a way to get to know both sisters, but can he sort through the confusion in time to turn the worst vacation ever into something truly wonderful? This was such a cute, little story. I was holding my breath until Graham revealed the truth about what happened, but, of course, everything worked out! If you enjoy stories by Shelley Shepard Gray, you’ll enjoy A Reunion in Pinecraft! 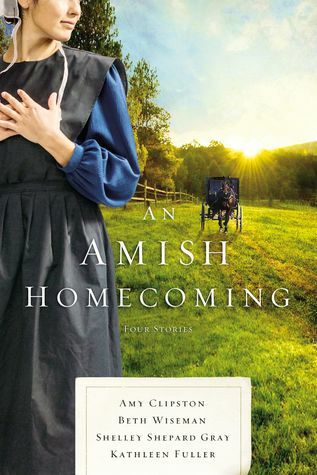 Today I am reviewing An Amish Homecoming, by Amy Clipston, Beth Wiseman, Shelley Shepard Gray, and Kathleen Fuller. I enjoyed this collection of novellas; the authors always entertain me with interesting themes, colorful characters, and each story fits perfectly in the book. In Amy Clipston’s No Place Like Home, young Simeon provides the perfect excuse for Eva to visit her family. I love Ian’s character… and how wonderful he is… and how determined he is to do the right thing. This is a wonderful story of forgiveness and how important family is. Beth Wiseman’s When Love Returns, features Sarah Zook, who left home after learning that she was pregnant. When Hurricane Harvey forces her to return home, she finally learns the truth about what happened on that fateful night. A great story of happily-ever-after. Shelley Shepard Gray’s The Courage to Love is my favorite story in this compilation. Irene Kim is living with her new friends, Mary Ruth and Henry Wengerd, and helping out around their farm, when their son shows up. Marcus doesn’t understand why his parents took her in and when he learns who she is, he’s even more upset. After a mountain of misunderstandings, Marcus tries to apologize, but Irene isn’t impressed. This story includes Alice and Calvin Fisher (we met them in His Risk). Kathleen Fuller’s What Love Built features Carolyn Yoder, who is working diligently to open a new bakery. When she meets Atlee Shetler, she’s knocked on her behind — literally! This is such a nice story… about two people who need each other but don’t want to admit it. Will they be able to face their past troubles and build a future? Read this story to find out. 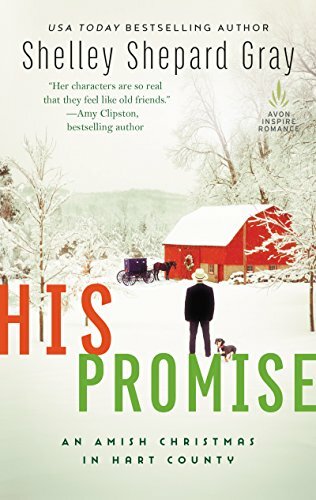 Today I am reviewing His Promise, the sixth book in The Amish of Hart County series by Shelley Shepard Gray. The infatuation John Michael once saw in Grace’s eyes is long gone, though his complicated attraction to her remains. He had walked away all those years ago when he realized he was falling in love with the wrong sister. Now, as suspicious fires are set in their community, that’s not an option. Grace dismisses his warnings, and John Michael vows to keep an eye on her. But he can’t help wondering if he’s reconnected with Grace, only to risk losing her again. A more immediate problem is the fact that someone is setting fires in their community. But that’s not all… homes are being broken into around the same time as the fires are set. Are the break-ins and the fires being set a coincidence — or are they related? Just as she feared, Grace’s family has never forgiven John Michael for leaving her sister and they aren’t happy that she’s becoming involved with him. I would have thought that this sweet, Amish family would be full of forgiveness — but I guess not. Chapter after chapter, I kept wondering… and trying to guess as to who could be causing all the trouble. I’ll admit, I figured from the start that the break-ins and fires were related. I just couldn’t figure out who it could be. And of course, since I read the story, I’m not about to say so now. What I will do is encourage you to read this story for yourself. Matter of fact, I think you should read all six of them — in order, of course. I have thoroughly enjoyed this wonderful series. The characters are interesting, most of them with colorful pasts, and deep, dark secrets. Ms. Gray does a superb job of holding the reader’s attention, not to mention needing a box of tissues! I hope you enjoy this story — this series — as much as I did. 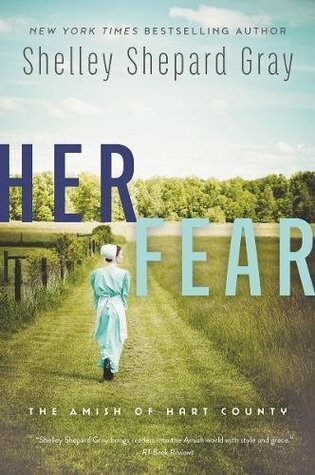 Today I am reviewing Her Fear, the fifth book in The Amish of Hart County series by Shelley Shepard Gray. Sadie Detweiler never imagined she’d move to Kentucky, yet here she is: a pregnant, unmarried Amish girl banished by unforgiving parents to live with kin she barely knows. The men are gruff and her cousins are secretive. Worst of all, elderly matriarch Verba becomes mysteriously ill shortly after Sadie moves in. When EMT Noah Freeman arrives, Sadie immediately notices he’s unlike any other Amish man she’s met. Noah is warm, confident, and has an easy way with practically everyone in the community, both Amish and English. Though Sadie is drawn to him, she has little hope he will reciprocate her feelings once he learns she’s with child. Her Fear begins with the sad story that a young Amish girl has gotten in a family way… but what happens next is almost impossible to believe. Instead of marrying Harlen Mast, the father of her baby, Sadie Detweiler is driven to the bus stop — to travel to Kentucky — and told in no uncertain terms that she is no longer part of their family and to never contact them again. Boy, oh boy, was I ever angry at that stupid Harlen Mast.. but not nearly as much as her own father, who disowns her! Then it gets even worse… but I can’t tell you about that because it would most likely ruin the story for you. I can tell you that Noah Freeman meets Sadie and wants to help her. But when her parents demand she return to their home to. . . oh no, I can’t say anymore! But I can say that I was so angry it’s probably a good thing they’re not real people or I would have wanted to find them and smack them! I guess I can admit that this story seemed very real to me — and kept my attention to the very end. Shelley did an amazing job telling this story and I look forward to reading future books by her. I am thoroughly enjoying this wonderful series. The characters are interesting, many with colorful pasts, and deep, dark secrets. Ms. Gray does a superb job of holding the reader’s attention, not to mention needing a box of tissues! I hope you enjoy this story as much as I did. 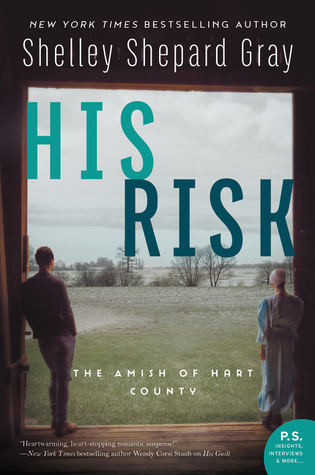 Today I am reviewing His Risk, the fourth book in The Amish of Hart County series by Shelley Shepard Gray. His Risk continues the story of the Fisher boys… Mark’s brother Calvin returns to Hart County when Mark’s wife calls him with the news that Mark must have surgery. But he had no idea that shy, sweet Alice Yoder, who lives across the street from Mark and Waneta, would soon claim his heart. I have thoroughly enjoyed this wonderful series. The characters are interesting, many with colorful pasts, and deep, dark secrets. Ms. Gray does a superb job of holding the reader’s attention, not to mention needing a box of tissues! I hope you enjoy the story as much as I did. 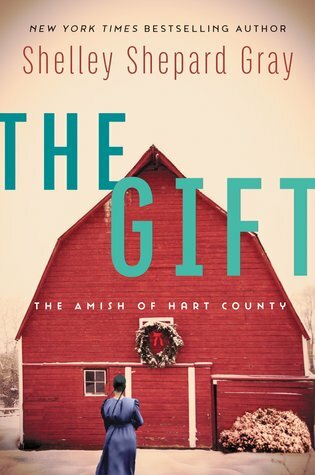 Today I am reviewing The Gift, the third book in The Amish of Hart County series by Shelley Shepard Gray. As long as Shelley keeps writing Amish fiction, I’ll keep reading it… because I have LOVED each and every one of her books! I can only imagine how difficult it would be to move to a new home just before Christmas. A place where you don’t know anyone and everyone seems unfriendly. Neil Vance knows Susanna Schwartz and her family are not responsible for his family losing their farm. And the accidents. . . well, he thought they were truly accidents. Obviously, I lost myself in the story, but will I find my way back out? Join me and spend Christmas with the families in Hart County. Shelley truly does give us a story full of love and blessings–one we’ll cherish at Christmas time. Whatever you do, don’t miss out on this wonderful story.